Think storage wars for wine lovers. To the everyday consumer, the world of fine wine auctions may seem a bit out of reach, but for countless wine aficionados, it's game time. To them, nothing could be more exciting than sitting amongst the world’s biggest collectors, surrounded by fabulous wines, immersed in a cutthroat bidding war for the industry’s most sought-after bottles. You can expect nothing less from the upcoming Sotheby’s Maison Joseph Drouhin & Domaine de la Romanée-Conti auction, which promises to be once in a lifetime. On October 13th, Sotheby’s will be presenting a historic offering of unforgettable bottles from Domaine de la Romanée-Conti (DRC), with vintages ranging from 1937-1964, pulled from the personal collection of Mr. Robert Drouhin, legendary Burgundy négociant and former distributor of the estate’s wines. Mr. Robert Drouhin, patriarch of the family-run négociant Maison Joseph Drouhin, isn’t just recognized as one of Burgundy’s most influential wine professionals. He's also a serious DRC aficionado, who has acquired hundreds of various lots of wine throughout his career. During the mid 20th century, Drouhin and his father, Maurice, were the exclusive distributors of DRC in France and Belgium, adding a uniquely personal touch—as well as promising, uncompromised quality—to the wines set to auction in less than two weeks. In addition to the already impressive DRC lineup, various bottles of Maison Drouhin Grands Crus—spanning the 1959,1961, and 1962 vintages—will also be available. Serena Sutcliffe, MW, and Honorary Chairman of Sotheby’s Wine says, “It is a great privilege for us to offer this historic collection of wines from the Drouhin family’s legendary cellar.” Sutcliffe describes the selection as “an enchanted kingdom in the realm of wine,” spanning an array of Burgundy's most sought after vintages. Furthermore, she highlights the additional factor of the longtime, personal relationship between Domaine de la Romanée Conti and the Drouhin family, emphasizing the unique nature of the auction. Sutcliffe refers to the supplemental Drouhin Grands Crus offerings as the "icing on the proverbial cake" to this unforgettable event. Auction highlights include 16 lots of Romanée Conti from 1937-1964, ranging in price from $13,000-$40,000 per lot, magnums included. Twenty-three lots of DRC La Tâche (from various 1941-1964 vintages) will also be on display, sold for $3,000- $26,000 per lot. Forty-seven lots of 1947-1964 DRC Richebourg will be sold from $5,000-$15,000, and last but not least, nine lots of Maison Joseph Drouhin Grands Crus will go for $4,000-$12,000, hailing from the appellations of Musigny, Bonnes Mares, Clos de la Roche, and Griotte Chambertin, all from the 1959, 1961, and 1962 vintages. 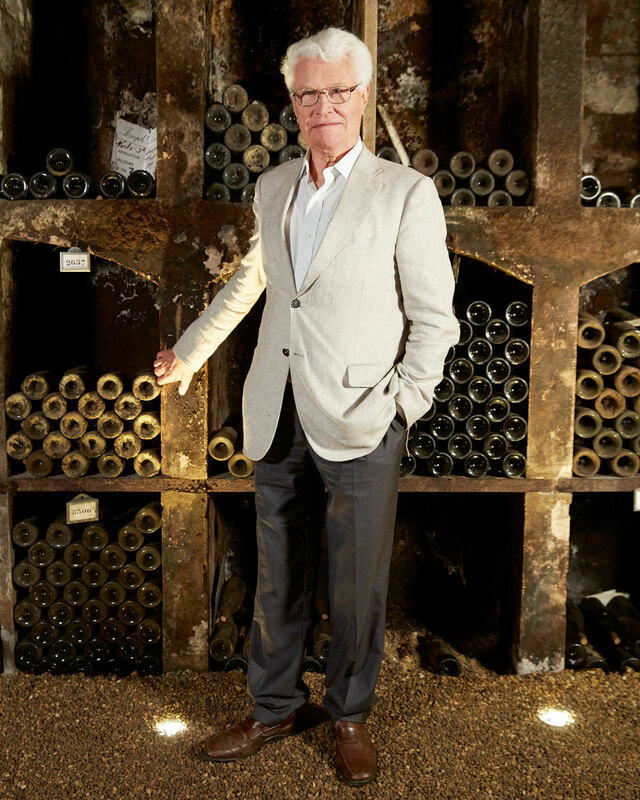 Robert Drouhin notes that the wines have remained undisturbed for over 50 years, having never left his personal cellar. He explains that the wines span four decades, covering historic vintages from one of Burgundy’s most important—if not, the most important—estate. Many bottles set to auction this October were stored in a specially created, underground labyrinth, shielding the bottles from protection during the second World War. Maison Joseph Drouhin was established in 1880, and quickly became one of Burgundy’s most important and well-regarded négociant businesses. In 1919, the Drouhins began acquiring vineyards under Joseph’s son, Maurice, and the house became the exclusive importer of DRC wines within France and Belgium from approximately 1928-1964. Upon Maurice’s death in 1955, his son, Robert Drouhin, took over the company, vastly expanding business into a globally-renowned operation. Today, Maison Drouhin is managed by Maurice’s four grandchildren, who seek to continue on their family’s legacy. Domaine de la Romanée Conti, meanwhile, is widely regarded as one of the world’s greatest producers of wine, located in Burgundy’s Vosne-Romanée appellation. After a 1760 bidding war, the vineyard fell into the hands of Louis Francois, Prince of Conti, ultimately becoming auctioned off during the French Revolution. After various sales and acquisitions, the estate is currently co-owned by the de Villaine family, as well as by Pauline Roche, daughter of Henri Leroy. DRC is known for its highly sought-after wines, characterized by impeccable balance, powerful structure, and age-worthy characteristics, deemed undeniably perfect by critics, sommeliers, and collectors worldwide. “I have been fortunate to enjoy many of these exceptional bottles with friends and family over the years," Douhin says, "and now it is time to share them with others."